Martinsville is one of the most exciting tracks on the Cup circuit. It’s short, and tight, and there are zero aerodynamics involved. The turns are concrete with asphalt straightaways. It’s a half mile track so drivers are always battling traffic. Brakes fail, cars get hot and tires get cuts and flats. Two of the more impressive drives of recent time have come in the last two spring races. In 2005 Jeff Gordon lost three laps early on die to an unscheduled pit stop. He earned two laps back by passing the leader and then got a lucky dog near the end of the race. With several of the best cars having problems, Gordon took advantage and worked his way to the front for the win. The impressive win was not without controversy. On his late march to the front, he made contact with Kurt Busch spinning him into the fence. 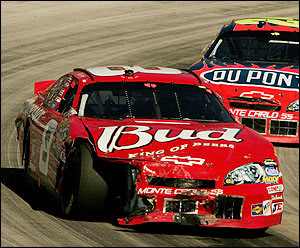 In 2006 cars got bunched up on lap one, resulting in a large accordion-like wreck. Dale Earnhardt Jr’s car suffered severe damage with the right front fender torn off. As he limped back to the pits, hoses snaked out of the hole, giving the appearance of a car that would spend the rest of the day merely turning laps. The team pitted several times under the caution, but managed to stay on the lead lap. The cars’ entire right front tire was exposed, but Earnhardt Jr. continued on. As the race progressed,the 8 car kept climbing the leader board, getting as high as 5th. A second incident with Ryan Newman sent Earnhardt Jr. back to the pits for repairs. Despite two major incidents during the race, Junior still was one of the fastest cars at the end of the race, finishing 4th. Neither of these finishes could happen at most tracks. The speeds are too fast and it’s too hard to overcome three laps or major body damage. Some might complain that Martinsville is too slow or it’s too hard to pass. What is wrong with a track being tough to pass on? It is much different than an intermediate track that is hard to pass on because of the aero-sensitivity. It’s simply a small track with one groove. It actually puts more responsibility in the drivers’ hands and that’s where everyone wants it anyway. If it was too easy to pass, every race would be like Michigan. -Fox is televising the Craftsman Truck Series event at Martinsville on Saturday. It is the first CTS race on network television since 2000. For many fans without the Speed Channel (including myself) it is a look at the most consistently competitive series in NASCAR. With many sponsors and manufacturers withdrawing support, it’s a needed boost of exposure for the series too. It’s also a good thing the race will finish before the Final Four games tip off. -The only Martin to win at Martinsville is Mark (’92, ’00). He is not entered this weekend so it is up to Martin Truex Jr. to try and carry on the Martin’s Ville mantel. That is unless Matt Martin shows up or maybe Marty Snider takes a hot lap. -Richard Petty has won the most grandfather clocks with 15. Darrell Waltrip has 11 wins. The only active driver with more than two is Jeff Gordon (7). -Hendrick Motorsports has won six of the last eight races at Martinsville. They have also won the last three weeks in the Nextel Cup in 2007. -This week is the CoT is again the focus. Expect the usual teams and drivers to be at the front: Tony Stewart, Denny Hamlin, Jeff Gordon, Jimmie Johnson. My pick this week is Stewart. In the last four races he has led 818 laps at Martinsville. He has three straight top fives including a win last spring. Watch out for Jamie McMurray as a dark horse. He ran well last week at Bristol and has 5 career top tens in 8 races at Martinsville. -My other predictions are Ohio State and UCLA to meet Monday night. Watch out for Billy Packer,Billy Packer Man-Crush Award include Joakim Noah, Sean May, Chris Duhon and of course, the all-time great Mateen Cleaves. Who will it take the Man-Crush Award this year? My guess is Ohio State point guard Mike Conley Jr.